Caraibes Remorquage, the body appointed to oversee operations at Pointe-à-Pitre harbour on the French Caribbean island of Guadeloupe, has ordered a tug from French builder Piriou’s yard in Hô Chi Minh-Ville, Vietnam. The forthcoming newbuild will be constructed to the specs of Piriou’s OST 30 class, which has been specifically designed for push-pull harbour assistance, sea towing duties and providing assistance to vessels approaching access channels. According to Felix Ramaye, Caraibes Remorquage manager, the tug has been ordered as part of an overall investment in Guadeloupe’s Jarry terminal, “and [because] of the increase in the capacity of the container ships we have to assist”. 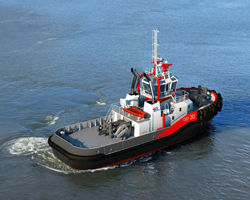 To be fashioned from steel, across both hull and superstructure, the tug will feature an overall length of 30.3m, a 10.4m beam, a depth of 4.45m and a 5m draught. The vessel will accommodate four to six crew members, while onboard tankage will provide capacity for 87,000litres of fuel oil and 26,000litres of water. Power will be provided courtesy of a pair of diesel engines, each rated 1,678kW, driving an azimuth stern drive propeller apiece. This arrangement will help the vessel to achieve a service speed of 12.5knots and a bollard pull of 55tonnes. Other features are set to include a towing hook, firefighting equipment and fenders that have been adapted to push barges with low freeboards, Piriou says. Delivery is scheduled for Q1 2018.